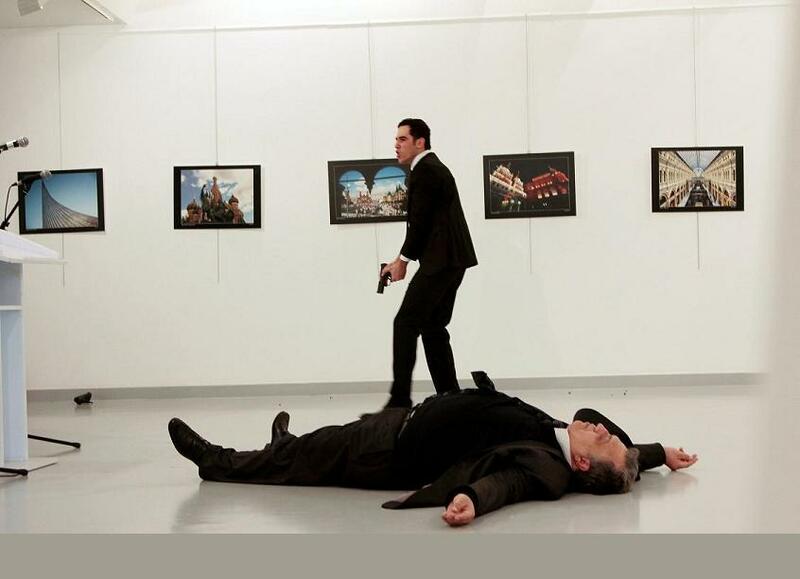 Russian ambassador to Turkey, Mr. Andrey (Andrei) Karlov (1954-2016) was shot dead in Ankara on December 19, 2016 while making a speech at an art exhibit in Çağdaş Sanatlar Galerisi in Ankara. Mr. Karlov was a respected and beloved diplomat who showed great efforts in developing Turkish-Russian relations as well as solving the diplomatic crisis that took place following the “jet crisis”. Mr. Karlov was also a rare expert on North Korea and his loss will be a loss of the international diplomacy, not just Russian diplomacy. Turkish government will name the art gallery and the street of Russian Embassy in Ankara after him in order to honor his memory. Assassination took place a day before the trilateral meeting between the Foreign Affairs Ministers of Iran, Russia and Turkey in order to find a solution to ongoing Syrian civil war. Thus, the assassination was a terrorist event that carried some political meanings. The assassin was a young Turkish police officer, Mevlüt Mert Altıntaş (22), who was off-duty that day. Altıntaş shouted “God is great!” (Allahuekber) and “Don’t forget Aleppo, don’t forget Syria!” in order to show his reaction to Russian support to massacres taking place in Aleppo. His -not so fluent- Arabic speech contained some slogans similar to Al Nusra group’s slogans in Syria according to Turkish security experts. Turkish officials said the assailant was killed by other officers in a shootout afterwards. Thus, Altıntaş’s testimony could not be taken and he was in a sense silenced. So, his personality and connections will be a mystery. Turkish officials on the other hand immediately blamed Fetö, an alleged Islamic group whose leader Fethullah Gülen lives in the United States. These accusations are suspicious since the young police officer was appointed during Justice and Development Party (AK Parti) period and Gülenists have already been purged so far from the state in the last few years, especially after the coup attempt of July 15, 2016 this summer. However, Altıntaş studied in a school close to Gülen community, which also shows that there might be a real connection between Gülenists and the assassin. The assassination was an embarrassing event for the Turkish state, a state that has evolved into a semi-Islamic authoritarian Middle Eastern country from a secular European state under the leadership of President Recep Tayyip Erdoğan simultaneously with the gradual weakening of the country’s security policy. Russian side was quick to react, but they were very cautious this time unlike the jet crisis of the last year. Russian President Mr. Vladimir Putin described the assassination as an effort to sabotage Turkish-Russian relations, a view that is also shared by Mr. Erdoğan. Russian Prime Minister Dmitri Medvedev also spoke very cautiously and did not blame Turkish people or Turkish state. A Russian police squad will be in Turkey to investigate this assassination this month. It might be a good decision to look at the political consequences of the assassination instead of commenting on police issues. 1. Politically, this unfortunate event will make Turkish-Russian rapprochement inevitable since the Turkish state now feels intimidated against their giant northern neighbors. Although there was a strong public reaction in Turkey in the last few weeks against Iran and Russia due to Aleppo events, now the oppositional voices are weak and largely considered as part of the radical Islamist wave. That is why; an unlikely consequence of the assassination is the strengthening of Russia and Iran against Turkey especially concerning the Syrian civil war. In addition, Turkey might not be insistent on the removal of Syrian President Bashar al Assad from his post from now on. Thus, the assassination helped Iran, Russia and Syrian President Bashar al Assad. 2. Pro-Russian and pro-government groups were quick to blame United States for the assassination in the social media, an issue that might fuel anti-Americanism in Turkey and spoil Turkish-American relations at least temporarily. Especially the residence of Fethullah Gülen in the U.S. might turn into a political crisis between USA and Turkey. Since Gülen lives in the United States under the protection of the American state for long years, blaming Gülen for assassination is nothing but to blame United States. However, this might also cause a policy change in Washington concerning Gülen and Washington might decide to extradite Gülen to Turkey. New American President Donald Trump’s aides previously showed their lack of sympathy for Gülen community but since United States is a country that is based on rule of law principles, Gülen’s crimes should be documented by Turkey in order to convince USA. It is a difficult process; because the Turkish government officials and even Turkish President Erdoğan had previously praised Gülen and his community in the public many times. 3. The assassination proved that the radical Islamist and jihadist groups are infiltrated into the Turkish state during the Justice and Development Party period. Especially Turkish security bureaucracy and police force gives alarming signals in recent years concerning political Islam. Islamism and nationalism are very common among Turkish security officers, a fact that might facilitate far-right Islamist infiltration. Altıntaş seems to be a sympathizer of Al Nusra Front, a radical Sunni revolutionary group that was emerged during the Syrian civil war. There might be other cells and members of ISIS and Al Nusra within the Turkish security forces and no one can guarantee that there will not be another attack in the following days. In fact, according to Russian press (Sputnik), Altıntaş attended previously to some of the travels of President Erdoğan, which shows that even President Erdoğan might not be in a safe position. 4. The assassination shows that Turkey has been gradually turning into a country of chaos. In the good old times, when things were getting chaotic, Turkish Armed Forces (TAF) was ready to intervene and to save the nation from political turbulence. However, now that the TAF’s political power is broken -especially after the last coup attempt-, President Erdoğan might take advantage from this crisis as the only strong political actor in the country. He might realize a smooth transition into Presidential system with an early referendum in the next few months. However, Erdoğan is also a divisive figure and he is not welcomed by secularists and pro-Kurdish groups in the country. There are also serious concerns about the democratic nature of Erdoğan’s “Turkish type Presidentialism”. 5. The assassination will discourage people who are critical of the government as well as political opposition groups. Once guns are involved, democratic actors are weakened. So, there might be a growing authoritarianism in Turkey in the next few years due to increasing security concerns. However, in fact, security weaknesses are caused by the authoritarian policies that produce terror in a vicious circle and encourage foreign support to terrorism against Turkey. 6. Turkey should rebalance its foreign policy between Sunni and Shiite states in the Islamic world and should turn into a balancing actor as in the old days. Turkey could achieve more as an intermediator country instead of becoming a leader of the Sunni world. The same mentality could also be used by Turkey concerning relations between Russia and the Western countries. As a NATO member and EU candidate country that has strong economic and cultural ties with Russia, Turkey might help these sides to reconciliate and find a solution to crises in Ukraine, Syria, Iraq and Yemen.